Home Renaissance Resources Go Medieval on Your Costume with Pearson’s Lorica Segmentata for Sale! Here at Pearson's Renaissance Shoppe, we are much more than simply a source for Medieval and Renaissance costumes. Our extensive selection of authentically-styled pieces also includes tough-to-find Lorica Segmentata for sale! The Romans are believed to have introduced this type of laminated armor, which consisted of broad metallic strips or girth hoops fastened internally by leather straps. This armor was believed to be used throughout the Roman Empire at the height of its power. Although it isn’t as heavy as original artifacts, our Lorica Segmentata for sale is based on Roman armor found in Newstead, Scotland, that dates from the second century A.D. This particular armor style typifies what the public thinks of when Roman soldiers come to mind, even though it never completely replaced mail and scale armor. While original artifacts were made of soft iron on the inside and mild steel on the outside with brass fitments or simple rivets that closed various plate sections, our replica Lorica Segmentata for sale is manufactured with 18 gauge steel by Windlass Steelcrafts® and fits chest sizes of 42 inches to 46 inches. The armor's form allows for very compact storage. Our replica armor is also flexible to allow for great freedom of movement. In addition to steel Lorica Segmentata for sale, Pearsons Renaissance Shoppe is also excited to offer a leather version. This finely made replica armor is similar in style to the steel version and is based on those used in Focus Features Roman film entitled, "The Eagle." This piece of replica armor also allows for free movement that will aid in the utilization of weapons during reenactments. While replica armor is essential for reenactments and historical representation, you will need to be clad in more than just our Lorica Segmentata for sale. Browse through our many pages of items to find Roman belts, cotton pants and chain mail. 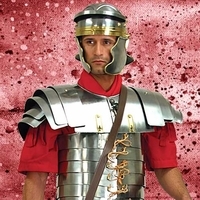 For your reenactment commanders, we can also supply a detailed Roman cuirass and backplate made from brass plated steel, and mesh mail Mithril shirts and vests that will lend a complete air of Roman Empire authenticity to any show or reenactment scenes you and your company will perform!